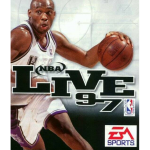 A while back, a dig through some old backups yielded several long-lost files for NBA Live 96 through NBA Live 08. I uploaded them all to our Downloads section not long ago, but for those who may have missed them, I’ve got some file additions bulletins lined up. Today’s batch of recovered treasures include draftee and international rosters for NBA Live 97 PC. Check them all out at the links below!